After you create links between tasks, you can specify conditions for each link to determine the order of execution in the PowerCenter - Workflows. If you do not specify conditions for each link, the PowerCenter - Integration Service executes the next task in the workflow by default. If the link condition evaluates to True, the Integration Service runs the next task in the workflow. 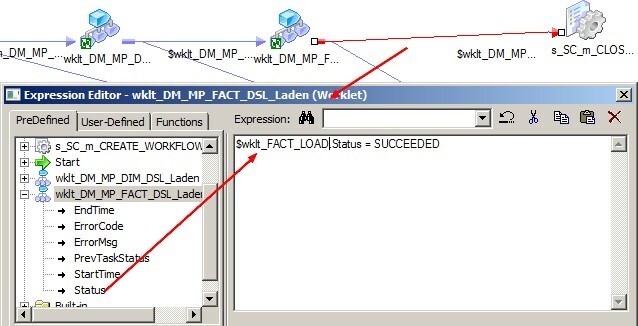 The Integration Service does not run the next task in the workflow if the link condition evaluates to False. You can also use pre-defined or user-defined workflow variables in the link condition. You can add comments using -- or // comment indicators with the Expression Editor. Use comments to describe the expression. You can view results of link evaluation during workflow runs in the workflow log. Double the link and enter the expression condition in the Expression Editor. 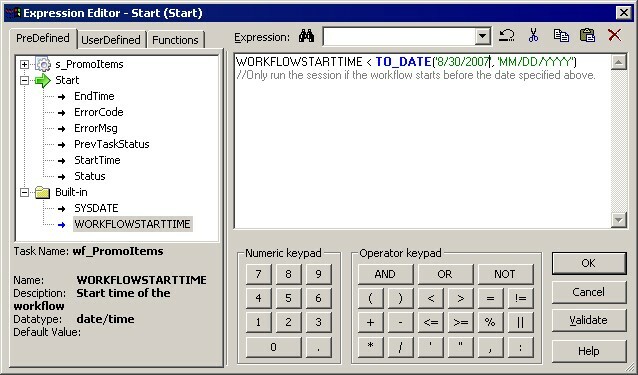 // Only run the session if the workflow starts before the date specified above.